Philadelphia has two main courthouses. The Philadelphia Court of Common Pleas is located at Philadelphia City Hall, Chestnut Street, Philadelphia PA 19107. Additionally the Federal Courthouse of the Eastern District of Pennsylvania is located at James A. Byrne U.S. Courthouse 601 Market Street, Philadelphia PA 19106. A Philadelphia wrongful death lawsuit can be brought in either location depending on the facts and circumstances surrounding the Philadelphia fatal accident. Our Philadelphia lawyers are prepared to bring a wrongful death lawsuit in the Philadelphia Court of Common Pleas or the U.S. Eastern District Federal Courthouse. Philadelphia roads and highways have seen an increase in fatal motor-vehicle accidents over the past few years. Highways like the I-76 Schuylkill Expressway, Interstate 95, I-276, The I-476 Blue Route and Interstate 676 are seeing a record high in automobile travel and tractor-trailer semi truck accidents. Additionally, inclement Philadelphia weather has caused numerous fatal car accidents on the I-76 Schuylkill Expressway and I-95 in recent years. Sadly, there were 93 wrongful death motor vehicle accidents in Philadelphia County in 2016. Our Philadelphia wrongful death lawyers work with the highly regarded car accident reconstructionists to unsure to best results for our Philadelphia clients. Our Philadelphia lawyers will meet you and your family at any of the local Philadelphia hospitals, if that is more convenient. We travel to Thomas Jefferson University Hospital at 132 S 10th St, Philadelphia, PA 19107, Hospital of the University of Pennsylvania at 3400 Spruce St, Philadelphia, PA 19104, the Children’s Hospital of Philadelphia located at 3401 Civic Center Blvd, Philadelphia, PA 19104 and Pennsylvania Hospital at 800 Spruce St, Philadelphia, PA 19107. Our relationships with each Philadelphia hospital are an asset for collecting crucial medical records for every Philadelphia wrongful death lawsuit as well as fatal medical malpractice lawsuits. We’re happy to reserve a conference room at any of the aforementioned hospitals, or the Philadelphia airport for a free consultation at your convenience. If you need a Philadelphia lawyer near me, we are happy to meet you at your residence, apartment or home. Call our Philadelphia wrongful death law firm today for a free consultation. Our wrongful death law firm works with the best private investigators and accident reconstructionists in order to put the pieces together after a Philadelphia wrongful death accident. These investigators and experts have excellent relationships with the Philadelphia Police Department located at 750 Race St, Philadelphia, PA 19106 and the Pennsylvania State Police Philadelphia Troop K at 2201 Belmont Ave, Philadelphia, PA 19131. After a Philadelphia wrongful death accident it is crucial that a law firm’s investigation work hand-in-hand with the local Philadelphia police departments to properly determine all responsible parties and preserve all evidence as quickly as possible. Our Philadelphia wrongful death lawyers are extremely familiar with the city of Philadelphia, which is crucial when picking a Philadelphia County jury for trial. We make sure our lawyers spend time in the city so that we have a familiarity with the community. On the weekends, our lawyers will visit the Philadelphia Museum of Art, the Philadelphia Zoo or the Philadelphia Flower Show. When he’s not litigating wrongful death lawsuits, attorney Trapani is a passionate supporter of the Philadelphia Eagles Super Bowl champs, Philadelphia 76ers, Philadelphia Flyers, Philadelphia Phillies and the Philadelphia Union. Additionally, there is no bigger Philadelphia cheesesteak fan around and we love trying all of the local Philadelphia restaurants. There isn’t a Philadelphia zip code that our lawyers are not familiar with. The Philadelphia skyline continues to change and grow. As of 2018, there are 20 high-rise buildings under construction. In Philadelphia, a high-rise means any building that is at least 75 feet tall or has “an occupied floor located 75 feet or more above the lowest level of fire department vehicle access.” 1213 Walnut Street is a 26-story high-rise developed by Goldenberg Group and Hines. The Ludlow is East Market Street’s first residential high-rise. The Curtis Center is undergoing a renovation that will include 63 luxury apartments. The Post Brothers bought the Atlantic and are converting the 21-story office building into a residential building with 160 rental units. Moreover, 218 Arch Street is the site of PMC Property Groups 10-story apartment complex. Last, the Comcast Technology Center will be the tallest building in center city Philadelphia. Some of the most common causes of serious Philadelphia construction accidents are construction accidents involving falls from scaffolding and faulty ladders, falling objects, motor vehicle accidents with trucks, cranes, forklifts, dump trucks, garbage trucks and tractor-trailers, and more. If you are in need of a Philadelphia construction accident lawyer, we are here to help. Furthermore, common Philadelphia workplace accidents can result from electrocution, trench cave-ins, unsafe warehouse conditions, structural collapse, utility worker falls, ironworker injury, burns and carbon monoxide poisoning. Our experienced Philadelphia construction accident lawyers have helped many victims of construction accidents in Philadelphia. 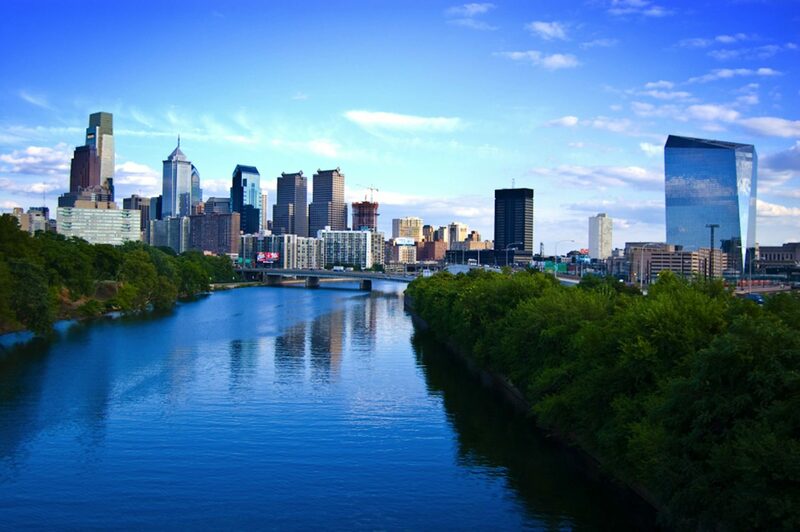 The Trapani Law Firm is proud to offer legal internships with all of the local Philadelphia colleges and universities. Our law firm accepts applications from Villanova University, Temple University, University of Pennsylvania, Drexel University and Penn State University. Moreover, these Philadelphia universities are some of the largest consumers of electricity in the city. PECO, an Exelon Company, located at 830 Schuylkill Avenue is the largest utility supplier of electricity in Philadelphia. Formerly called the Philadelphia Electric Company, PECO is responsible for most of the power lines that provide electricity throughout Philadelphia. The wrongful death lawyers at the Trapani Law Firm spend much of our time litigating Philadelphia wrongful death lawsuits. All of the aforementioned local experiences and Philadelphia activities are an established asset when it comes time to pick a Philadelphia County wrongful death jury. Moreover, our trial preparation cannot be outmatched and we will not be outworked. Call an experienced Philadelphia wrongful death lawyer anytime for a free wrongful death lawsuit consultation. We’d like to help you and your family navigate through this difficult time. Anyone who lives in or around Philadelphia knows that the city runs on public transportation. SEPTA (South Eastern Pennsylvania Transportation Authority) located at 1234 Market Street, offers public buses, trolleys and trains. SEPTA serves Bucks, Chester, Delaware, Montgomery and Philadelphia County. Additionally, Amtrak located at 2955 Market Street offers high-speed train options leaving from the 30th Street Station. Nothing is more traumatic than losing a loved one due to the negligent conduct of our Philadelphia public transportation institutions. Sadly, these avoidable tragedies and wrongful death accidents occur repeatedly in Philadelphia, Pennsylvania and across the country. We’re the experienced wrongful death lawyers in Philadelphia that can help get you and your family back on your feet. Call us anytime for a free consultation. Philadelphia Injury Law Firm - City Information	Overall rating:	5	out of 5 based on 10	reviews.